If you’ve listened to the news at all in the last few years, you know that the European Union has had its share of difficulties of late. 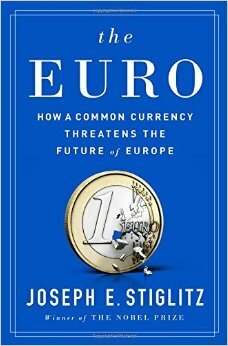 Nobel Prize-winning economist Joseph Stiglitz tackles the EU’s common currency, the euro, in his latest book. Stiglitz argues that the global financial crisis that began in 2008 revealed that Europe’s common currency was a flawed economic experiment. The book offers three options moving forward: reform the eurozone, end the euro, or embrace a new “flexible euro” system. Check the book out at Andersen Library and let us know what you think. Has the euro been a burden for Europe? Interested in more? Check out this TEDx Talk Joseph Stiglitz did in 2013. This entry was posted in new stuff tuesdays and tagged economics, Euro, Europe. Bookmark the permalink.